I love buying train tables. Whether it's a Brio, Imaginarium or others types...I always make money flipping a good table. But for some strange reason, this year was nearly devoid of train tables. It was looking bleak. But just when I thought my luck had run out....boom! In a single day at the yard sales, I found not just one...but two tables! As the saying goes, when it rains-it pours. On that particular day, it poured train tables! If you're caught up on my previous posts, I bought the tables on that busy Saturday in September. Yard sales were everywhere! So many in fact, that I nearly got lost in my own town! But I can't complain. In addition to the train tables, I scored plenty of stuff that will keep me busy selling for months. But nothing that day beat the two train tables I scored. I found the first table at a community yard sale held in a townhouse complex. Slowing driving through the neighborhood, I spotted the always popular, Imaginarium train table. It was complete with track and houses. The mom selling the table didn't live in the community. She told me she brought all her stuff to her parent's home to sell. Given this, I knew I already had an advantage. The mom would be super motivated to sell the big table, rather then face the prospect of hauling it back home. Taking advantage of her predicament, I bargained her down to a twenty dollar bill for the table. Even though it was a steal for me, the mom was pleased as punch just to get rid of it. (A common trait with most sellers. Train tables are too big to store, so folks are usually desperate to unload them.) The seller's elderly father even helped me load the table in the back of my truck. I pulled out of the neighborhood pretty pleased with the deal. Imaginarium train tables are always an easy, big bucks flip! With one in the bag, I figured I already hit my limit on finding train tables for the day. But I should have more confidence in myself! Rolling up to the final garage sale of the day, I eyed another winner. This time it was the much loved, "Thomas the Tank Engine" table! The table was sitting under a shade tree in the children's toy section of the garage sale. It looked awesome, but with an Imaginarium table already filling up the back of my truck, I wasn't sure I had room for one more. But then I reminded myself that after going the entire season without finding a train table, I shouldn't ignore this gift from the yard sale gods. I decided that if the price was right, I'd make room for one more! with an outrageous price of forty dollars! I shook my head no, adding that forty dollars was way too rich for my blood. She then dropped her price down to thirty. Still playing hardball, I told her she was still asking too much. Mom then asked me how much I'd offer for the table? At that point I pulled out my trump card. Pointing to my truck, I told her I already bought a train table today. Mom glanced over to the truck and looked defeated. Moving in for the kill, I told her that even though I already had one, I'd take the table off her hands for twenty bucks. She glanced nervously at my truck parked at the curb, completely stymied over what to do. Being an old pro, I decided to give her a gentle, psychological nudge. Smiling at her as if I could see into the future, I gave her this advise, "Look, I give you twenty bucks...and you don't have to carry the table back into the house later." That was all the push she needed. Agreeing that she didn't want the bulky table back inside, she accepted my low ball offer. 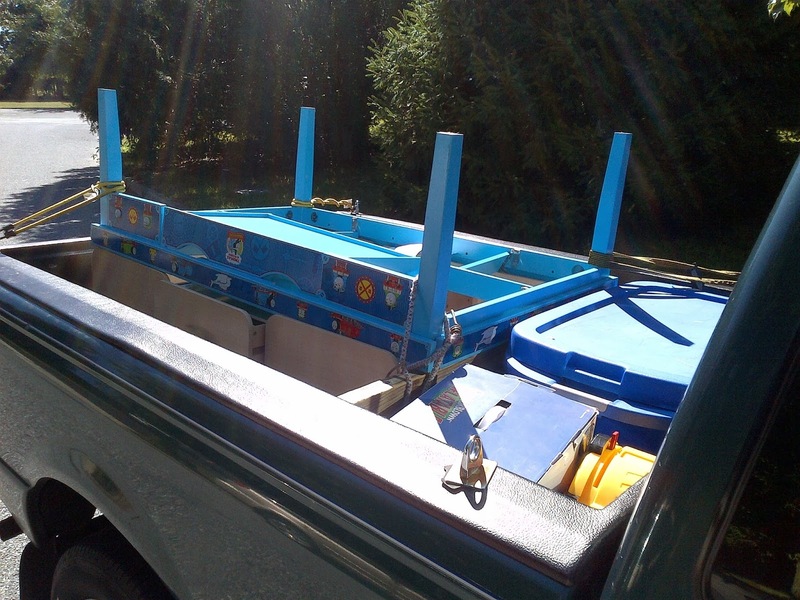 After handing over an Andrew Jackson to her, I happily carried the Thomas the Tank Engine table down to my truck. I strapped the second table to the first and headed home. It was a momentous "two-train table" day for me. A personal garage sale best that I won't soon break! With two train tables now taking up massive space in my garage, it was time to get to work. I decided to post only one table at a time on Craigslist. To do otherwise would just be competing against myself. The Thomas Table went up on CL first. Since the table had no accessories when I bought it, I added some Brio track and buildings I had in reserve. (Parents want tables that come with train, track and buildings...a total package.) Within days, I got a bite from some young parents. Prior to their arrival, I moved the Thomas table into my driveway, closing my garage door so they couldn't spot my Imaginarium table. I didn't want the young couple to get distracted, or think I was running a train table outlet store! After checking out the Thomas table, the young parents gladly paid me my asking price of $150 dollars. Cha-Ching! With one down, it was time to move on to the second table. The young couple had barely left my street, when I posted the Imaginarium train table. This sale turned out to be a little more amusing. After a few weeks on Craigslist in which I dropped the price several times, an interesting couple finally showed up to look at the table. The couple's son was barely a year old and clearly not ready to play with toy trains, but young mom wanted the table anyway. The enthusiastic mom checked out the train table while her husband, who was much older then his wife, stayed in the car with his sleeping son. Mom liked the table and immediately paid me my asking price of $100 big ones-not bad for a twenty dollar investment! white socks with open toe sandals! This struck me as a bit unusual, but maybe I just need to get out more? Either way, I felt a little sorry for the guy as he grudgingly carried the table down to the car. We then attempted to fit the big table into the back of his small SUV. Struggling to make the table fit, we began tilting the monstrosity. This little maneuver did not work out well for old dad....one of the table's large board panels fell out, landing squarely on dad's stocking toe! Closing his eyes tightly for a moment, he silently grimaced in pain while his young wife attempted to console him. It was quite a scene and I won't lie....it took every fiber of my being to keep from laughing! (That's what he gets for wearing sandals!) Not wanting to look wimpy in front of his young wife, older dad rallied. He shook off the pain and we finished jamming the table into his SUV. Dad limped back into his car and they pulled away. The coast was finally clear for me to laugh out loud over the whole misadventure! As I said in the beginning-it's fun flipping the train tables. In fact, maybe I should consider opening up that train table outlet store. Where else can you make a quick $250 in cash and have a good laugh at the same time? Thanks for enjoying the story....Dude! I think I've seen those, but they don't seem to be very popular. Not a bad idea for easy storage, but if it doesn't fit under the bed, it defeats the purpose, right? At least you made some dough out of the deal! Nice! With Christmas right around the corner, this is the perfect time to post HO trains. I have some too, need to break them out and photograph them for sale. Good luck selling the choo-choos and thanks for writing in...Dude! Ha, love the story! No train tables for me either. LOVE the look of 'em but as an apartment dweller ther'd be no space for one. Van - Glad you enjoyed it! Yeah, they do take up space for sure. Had to take over Mrs. Dude' side of the garage to store them until they were sold. She was not pleased! I loved the story too...!! Same is with one of my friends who is fond of train tables. But this year he could not buy a single train table which made he feel disappointed. However, surfing the web I found toytrainstable.com which is a website which always has the latest and update collection of train tables.